This image of minor salivary glands in the tongue contrasts the appearance of serous and mucous glands. In routine preparations such as this one, serous cells often appear darker appearance than mucous cells. Mucus does not stain well with standard acidic or basic dyes. The PAS reagent is used to demonstrate mucus. Nuclei of mucous cells usually appear dense and compressed in the base of the cell. Nuclei of serous cells appear rounder and usually more centrally located. 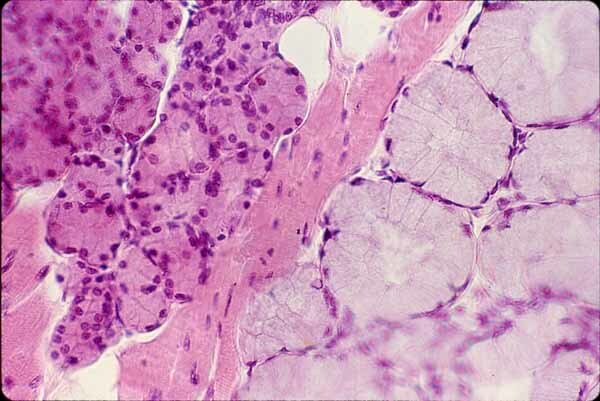 Serous cells are usually arranged into acini. Mucous cells. are usually arranged into tubules. In section, tubules are frequently cut such that the lumen is visible. In contrast, the small lumenal space at the center of each acinus is often missed by the plane of section so acini frequently appear "solid".